As my kids get older, I know I am going to have to work harder and harder to stay engaged with them -- but I know it's going to be worth the work. This year, Simon is in fourth grade and Grace is in first grade, and I find myself asking them every day after school, "So how was school today?" And every day I get an answer like "fine" or "good," which doesn't tell me a whole lot. AND I WANT TO KNOW A WHOLE LOT!!!! Or at least get a full sentence. So the other night, I sat down and made a list of more engaging questions to ask about school. They aren't perfect, but I do at least get complete sentences, and some have led to some interesting conversations... and hilarious answers... and some insights into how my kids think and feel about school. 2. Tell me something that made you laugh today. 4. Where is the coolest place at the school? 6. If I called your teacher tonight, what would she tell me about you? 7. How did you help somebody today? 8. How did somebody help you today? 9. Tell me one thing that you learned today. 10. When were you the happiest today? 11. When were you bored today? 12. If an alien spaceship came to your class and beamed someone up, who would you want them to take? 13. Who would you like to play with at recess that you've never played with before? 14. Tell me something good that happened today. 15. What word did your teacher say most today? 16. What do you think you should do/learn more of at school? 17. What do you think you should do/learn less of at school? 18. Who in your class do you think you could be nicer to? 19. Where do you play the most at recess? 20. Who is the funniest person in your class? Why is he/she so funny? 21. What was your favorite part of lunch? 22. If you got to be the teacher tomorrow, what would you do? 23. Is there anyone in your class who needs a time-out? 24. If you could switch seats with anyone in the class, who would you trade with? Why? 25. Tell me about three different times you used your pencil today at school. So far, my favorite answers have come from questions 12, 15 and 21. Questions like the "alien" one give kids a non-threatening way to say who they would rather not have in their class, and open the door for you to have a discussion to ask why, potentially uncovering issues you didn't know about before. And the answers we get are sometimes really surprising. When I asked question 3, I discovered that one of my children didn't want to sit by a best friend in class anymore -- not out of a desire to be mean or bully, but in the hope they'd get the chance to work with other people. 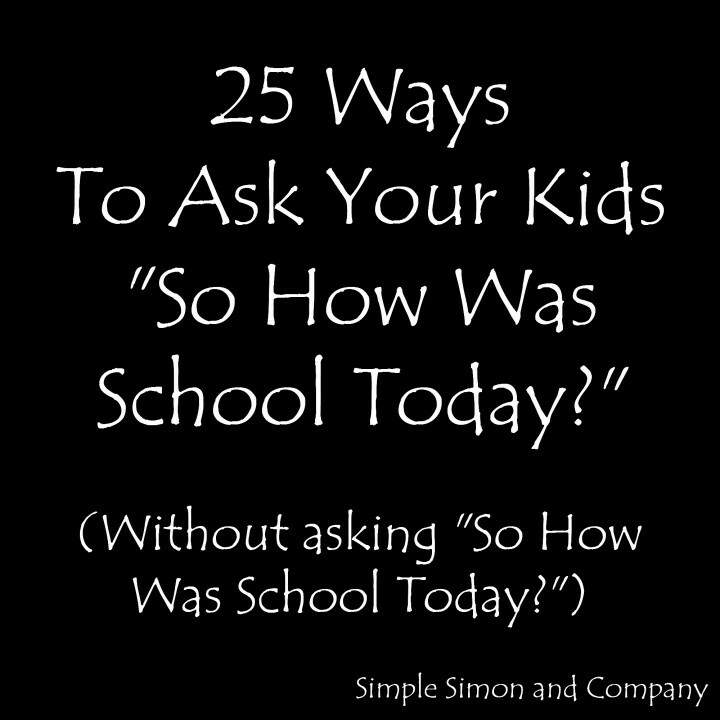 Read the follow-up to this post, "28 Ways To Ask Your Teens 'How Was School Today?' Without Asking Them 'How Was School Today? '," here. This post originally appeared on Simple Simon and Company.